This fall I reinforced the shed roof with a couple sheets of plywood. It was a hastily done task as it was snowing at the time - I used some scrap lumber I had left over from the Cottage construction. But it was very necessary! As you can see it is only the middle of December and already there is almost three feet of snow on the shed roof. 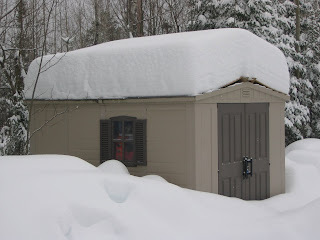 Last winter the shed roof almost collapsed under the weight of the snow. Plus it was damaged and leaked during the spring melt. I quickly nailed two sheets of plywood to a centre board at the peak of the roof, and inserted a post inside the shed to provide additional support for the centre beam. So far it looks like the quick & dirty fix is working. Next Spring/summer I intend to remove this quick fix and build a 'real' roof with a solid structure and shingles. But for now this will keep the contents safe for the winter. This weekend we are painting - both Saturday and Sunday. Hopefully we will be able to get two coats on both the ceiling and the walls on the main floor.